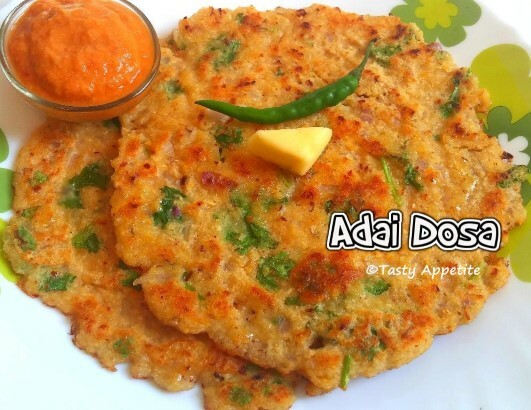 Adai dosa is a very healthy & filling dish made of rice and different lentils. Its very nutritious and tastes heavenly delicious with chutney or avial as side combo. The tempting aroma of added garlic and red chilly along with coconut makes it a favorite breakfast dish of everyone. Try this easy video recipe to make adai dosa at home in healthy version. Wash and soak boiled rice, toor dal and urad dal in water. Let it soak for 4 to 5 hours minimum. Add it to blender. Add garlic, red chilly, saunf pwd and salt. Add 1/2 cup of water and grind to coarse batter. Add freshly chopped coriander leaves, grated garlic and sliced onions. The batter consistency should be thick. Take a ladle full of batter and spread in concentric circles. Cook it on both sides in medium flame to crisp and golden. Lipsmacking delicious crispy Adai Dosa is ready. It makes a heavenly combo with kara chutney and butter.